Carol White-Griffiths and SportShotz Photography provides more than just action images. If you need publicity material for adverts or posters, I can provide design to publish and can arrange to take images for your individual needs. No more stock photos! Enhance your club or activity, use images to boost your profile on-line and in print. I'd love to hear from you if you have a project that I can help you with. No sport is too obscure or too small to miss out, contact me for details. 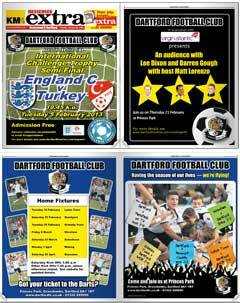 A further 4-sided newspaper advertising wrap for Dartford FC to advertise their prestigious hosting of the England v Turkey International Challenge Cup and to promote other major events for the Club. The Challenge Cup match was a major success and the 'Audience with' evening was well attended. Dartford Football Club has been flying high since the start of the 2012-13 season and the club has high aspirations for the rest of the season. 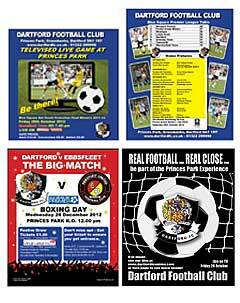 Another bold design for Dartford Football Club as a 4-sided newspaper advertising wrap, to promote a televised game and upcoming Boxing Day match. This artwork was prepared using a combination of Adobe Indesign, Illustrator and Photoshop and looked quite impressive even on newsprint quality paper. SportShotz photography provides images to Dartford FC Football Club, which are used on their fixture posters as well as all programmes throughout the season. For the past two seasons I have been instrumental in the creation of unique posters for Dartford Football Club pre-season matches. These posters, printed at A1 size can be seen around Dartford town, in the shopping centres and some supermarkets and are a great marketing tool. 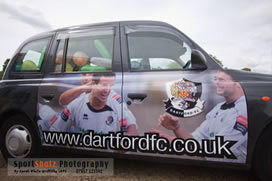 Dartford FC Football Club have used my images for an A3 size calendar, graphics as an advertising banner on a taxi and on a portable background. SportShotz photography has worked with Dartford Football Club to create an eye-catching inside and back page of a 4-page advertising wrap. 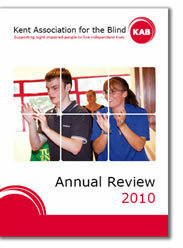 The front two pages were created by the main sponsor, Breeze Residential. During this period I also submitted images to Football Focus Magazine who were doing an article on Dartford FC, and the images were printed onto a high quality paper for this publication. For the start of the 2011-12 season the team had new main sponsors so the promotion material needed to be fresh to promote the pre-season games. That meant a special photoshoot as I could not use any of the past season's images. So on a rather wet and unpleasant summer evening I set up my speedlights and reflectors on stands on a large balcony area at Dartford Football Club and the team put on their new shirts and we has some fun and laughter creating some 'action' shots for the poster (left), which required some creative Photoshop skills to develop the final artwork. In addition, SportShotz photography has worked with ProFutures Soccer Schools who provide football and other sports activity training for young people in Kent. Working with children is fun as well as challenging. I am CRB checked but I would not expect to be left in sole charge of a group of lively children AND take pictures! SportShotz photography provides images and website design for martial arts clubs, including mushinbudo.co.uk , dartfordjujitsu.co.uk, and combat-jujitsu.co.uk. Martial arts is a particular passion, having been involved in martial arts for many years. During the summer break from football photography I catch up on some web design work, and like to check out other summer sporting activities. SportShotz photography has provided images for the Dartford Sharks Basketball. Local sports, played by non-professionals, doesn't always get sufficient attention and publicity to attract new members. In addition, I have provided photography to the Kent Association for the Blind on a voluntary basis, and images have been used in many of their publications, including their Annual Review. One of the assignments was to take images of an indoor activity day for sight-disabled youngsters and it was quite humbling to see how they coped with their disability and enjoyed taking part in what must have been quite challenging activities. In March 2013 Carol White-Griffiths had two pictures accepted for display at the Maidstone Museum which hosted the Kent County Photographic Association's Annual Exhibition. Both were football images, and one, the first here, received a 'Highly Commended' distinction, so I am very pleased about that. I am a member of the prestigious Royal Photographic Society and hold the distinction of Licentiate (an “LRPS”). I also belong to their Digital Imaging Group which holds an annual competition. In 2011 I entered a picture of Danny Harris’ goal in the back of the net, which was well received and was awarded a ribbon in this year’s DIG Digital Projected Image Competition. 650 entries were received from 219 people and the standard of entry was very high. Nice surprise, and to receive it on my birthday, even better.